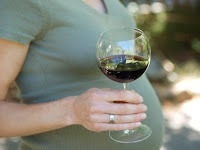 Today on Slate, Emily Oster makes the case for drinking while pregnant. No, seriously. I'm not about to get all judgemental about her pre-natal quaffing choices--lord knows if I were a pregnant woman I would find it hard not to take a few pulls at the Shiraz teat--but I will take issue with some of her word choices. I reviewed many, many studies, but I focused in on ones that compare women who drank lightly or occasionally during pregnancy to those who abstained. I'll forgive the double "many" in the interests of poetic licence, but what does the word "in" accomplish in this sentence? Granted, "focused on" doesn't exactly sing, but it does have the virtue of concision. The "in" should be discarded like a moldy cork. With these parameters, we can really hone in on the question of interest: What is the impact of having an occasional drink, assuming that you never overdo it? Here we get reacquainted with one of the first inductees into the copyeditor's Hall of Errors. To "hone" is to sharpen. The shopworn term the author was reaching for here is "home in on." Of course, there are a number of people who will claim that "hone in on," by virtue of common mis-usage, is now an acceptable alternative. These people, for the most part, have dents in their foreheads and had mothers who drank while pregnant.